A Diamond Select Release! 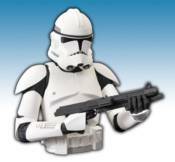 The perfect protection for your hard-earned Galactic Credits, this latest Star Wars bust bank features the cloned forces of the Republic - the unstoppable Clone Troopers! Measuring over seven inches tall and fully armed to blast would-be thieves, each bank's durable construction and light-weight design combine to create an economical top-quality display piece perfect for any Star Wars fan!